There was a range of emotions Friday as the final bell rang at Carver/Century K-8 School. 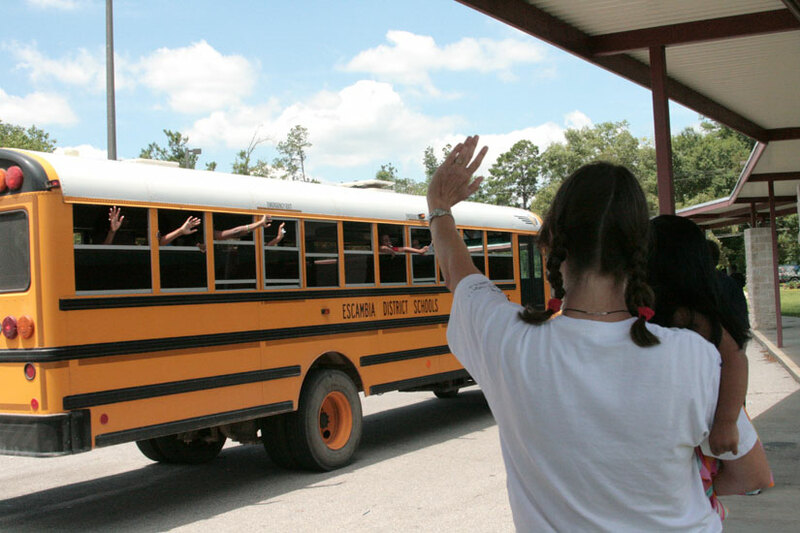 There was that last day of school excitement as students headed toward their buses. Goodbye hugs between teachers and students, playful laughter, the attempt to balance crayon boxes and report cards while running after a friend. It was, for most of the kids, an end that marked an exciting beginning to summer vacation. But for the teachers and staff gathered on the sidewalk outside the school, the emotions were much different, more of an ending that a beginning. That final bell marked the end of public schools in the town of less than 2,000. 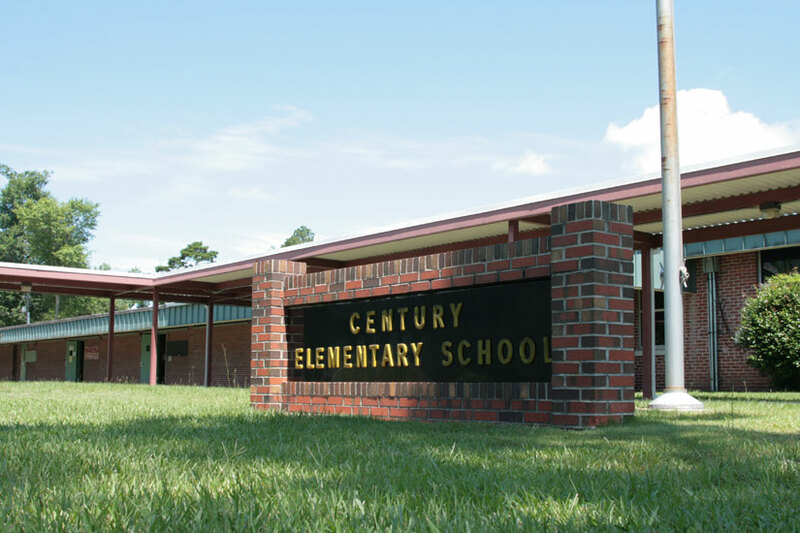 The Escambia School Board voted in March to close Carver/Century, the last school in Century, at the end of this school year. When that moment arrived Friday, reality set in. 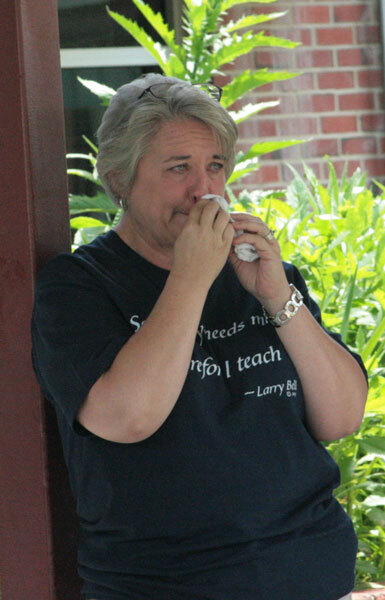 Some of the teachers and staff members stood alone, quietly sobbing. Others hugged and consoled coworkers. Some lingered, watching the buses full of waving children until long after they were out of sight. They gathered in the school cafeteria for a meal. A plaque was presented to Principal Jeff Garthwaite by Mayor Freddie McCall, honoring him for his service to the school and the community. Words about the school closure were few. The pain was evident on faces around the room. Someone passed around a box of Kleenex. The staff shared the meal, shared a lot of laughter over a school “Biggest Loser” weight loss contest that had been ongoing. They talked about who would be heading to Ernest Ward, who would be heading to Bratt Elementary. Once staff member fought back tears, saying that she would likely be headed to the Hall Center. It would be the first time in over 30 years in the school system that she will not work close to home. Schools and lumber were the backbone of the communities that would later become Century. Now the lumber company sits empty and overgrown. 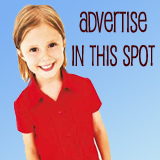 Townspeople hope that their school building does not face a similar weed-covered future. They hope they one day the laughter of school children will return to their town. Some said they felt defeated with the loss of Century’s last public school. Others just could not talk about it. But they all knew that while Century’s schools were now officially gone, they would always live on forever in the hearts and minds of those that had walked their hallways. That’s what they call Blackcat Pride. For a photo gallery from the final bell at Carver/Century K-8 School, click here. YOU are not the only ones to suffer. Look at Molino, we lost our school, our gas station, our diner, our grocery store….and you know what we are still going strong, our kids are doing fine….Century too will survive just be strong. WHY DO THEY HAVE TO TAKE EVERYTHING AWAY FROM CENTURY??? ?WHY CANT THERE TAKE IT AWAY IN OTHER PLACES…..FIRST THE SCHOOL NOW THE COURT HOUSE SOUNDS LIKE THEY WANT US TO FALL OF THE MAP…..WELL ITS NOT GOING TO WORK………WERE STRONG AND WE WILL GET IT BACK SOON………..THEY NEED TO THINK ABOUT WHAT THERE PUTTING THE KIDS THROUGH…. Don’t lose hope with god’s help and a lot of prayer the school will be back. I hope this will bite the school board in the but. They may take the schools away from the town of century but they sure as hell cant take the blackcat pride away from us.